TPP took a stroll around the estate a couple of days ago; it's what having gardens is for. Here and there a few plants remained in flower, sort of, more like the dregs of coffee in the bottom of the pot. This idea was stolen from PlantingPosting blog (it's on the side bar), but her's was prettier and better photographed, and we have really different gardens! And here they are. A couple are really tough plants, often flowering in the very early spring. One is missing the witchhazel, sorry but only saw the flowers later. And flowering in November is not unusual for this plant at all. The periwinkle and golden corydalis are also among our earliest flowering plants in the spring, so a few flowers in the fall are not a surprise. 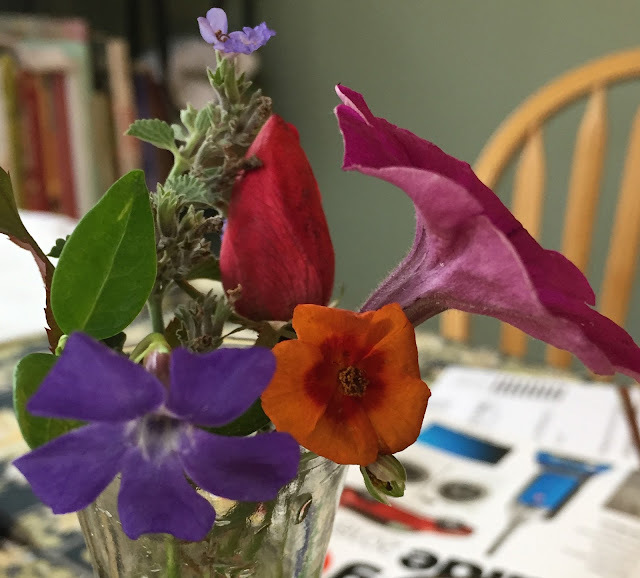 The warmth of the house protected a knockout rose from getting totally frozen so a bud or two remained, and then under the roses were a couple of volunteer petunias, probably from last year's window boxes to judge by the color & who even knew they were under the roses? The catmint had a few flowers left again a tough plant in cold weather. The orange "sun rose" a Helianthmum is just confused after a tough summer. The golden corydalis is amazing, flowering all season long nearly first to last. It is a bit weedy but not too aggressive often occupying spaces not suitable for other plants like under a bald cypress. But this is it. These are definitely the last of the season.